Joe LaCava, a Newtown, Connecticut native, embraces his boss - Tiger Woods - on the 18th green of the Masters on April 14, 2019, the same green where he caddied for Fred Couples 27 years ago when he won the Masters. 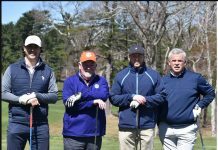 HARTFORD, Conn. – Newtown native Joe LaCava has caddied on the PGA Tour for 32 years, starting with his cousin Ken Green, a Danbury native and five-time winner on the PGA Tour whose career was dramatically affected by a horrific RV accident in 2009 that cost him the lower part of his right leg. LaCava went to work for Fred Couples in 1990, the start of a successful partnership that lasted more than 20 years, during which LaCava had 12 victories, including the 1992 Masters and 1996 Players Championship. When Couples took breaks due to back issues that began in 1994, LaCava caddied for the likes of Mark Calcavecchia, Justin Leonard, Mike Hulbert, John Cook, Jay Haas, Bill Haas and Camilo Villegas. LaCava stayed with Couples on the PGA Tour Champions until Couples encouraged him to go with a younger player who would be able to offer a steadier income. That’s when he hooked on with Dustin Johnson for four years, starting in early 2011, and they contended at the British Open and won the Barclays that year. 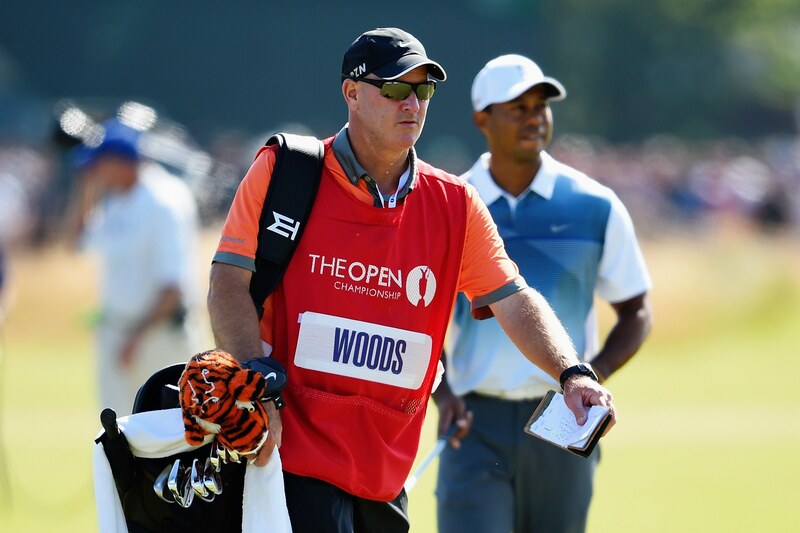 LaCava, 54, started with Woods in the Frys.com Open, but Woods was sidelined for several years due to injuries and surgeries, including spinal fusion. After the lengthy absence from competition, Woods returned for the Safeway Open in 2016 and seriously challenged in the final two major championships last year, the British Open the PGA Championship, before finally notching career victory No. 80 in the season-ending Tour Championship. 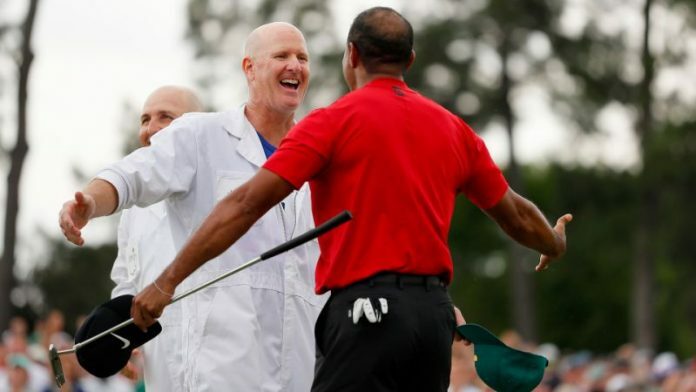 Then after more solid play early this year, Woods rallied for his first Masters victory in 14 years, a record, and 15th major title, three behind all-time leader Jack Nicklaus. It was the first time Woods prevailed in a major after trailing after three rounds, and he departed the 18th green and into the arms of his mother, two children and girlfriend, Erica Harman, a manager at his restaurant in Jupiter, Fla., as chants of “Tiger, Tiger, Tiger” echoed around one of the world’s most famous courses. LaCava, who retrieved the flagstick on the green, was almost certain that his boss would move within one win of Sam Snead’s career record and one of Nicklaus’ record for Masters titles. 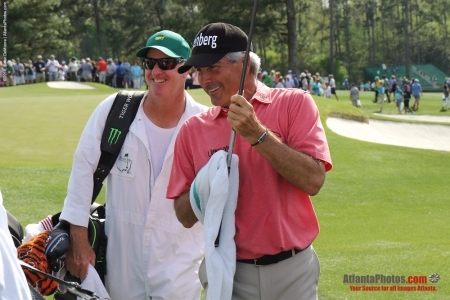 Fred Couples and Tiger’s caddie Joe LaCava share a laugh while walking off the green at the Masters tournament in Augusta Georgia during a practice round April 9. “He’s a very confident person so he always thought he could do it,” LaCava said. LaCava said the advice that he gave Woods on the first tee played out through most of the final round. “On the first tee I told him, ‘Intense but loose,’ ” LaCava said. “Don’t carry the weight of the world. It’s a delicate balance, to make sure you’re fired up enough to hit the big shots, but you don’t want to be so overwhelmed by the moment that you tighten up and lose your ability to swing the golf club as you know how to. But LaCava also cursed out his boss after Woods bogeyed the fourth and fifth holes to fall three behind Francesco Molinari, the reigning British Open champion. Woods then ducked into a restroom and cursed out himself before emerging a new man. A half-dozen marquee players had a chance to don a green jacket, but LaCava thought his employee’s major concern was Brooks Koepka, who repeated as U.S. Open champion and later won the PGA Championship that year. Woods was the only player to reach 14 under when he hit an 8-iron to 2 feet to set up a birdie 2 at No. 16. It was reminiscent of what Nicklaus did in 1986 when he became the oldest Masters champion at 46. LaCava jokingly denied Woods a read on the short birdie putt at the 16th. The incident epitomized the relationship between LaCava and Woods. Joe LaCava has been a caddie for 32 years on the PGA Tour, most notably on Fred Couples’ bag for nearly two decades, as well as his short stint with Dustin Johnson, but LaCava gained an extra notch in notoriety when he went to work for Tiger Woods at the end of 2011. And their tight relationship was emphatically displayed again after Woods tapped in for a calculated bogey at No. 18 and a one-stroke victory over Koepka, Johnson and Xander Schuffler. LaCava and Woods shared a mighty bear hug and then participated in some fun-loving horse play. After Woods received countless congratulations as he walked with his family and girlfriend to signing his scorecard, he was greeted at the clubhouse by several players, including past Masters champions Bubba Watson, Zach Johnson and Bernhard Langer, along with Koepka, Justin Thomas, Rickie Fowler and Ian Poulter. While the loud and prolonged adulation continued, LaCava leaned against a black Mercedes in the parking lot holding the 18th hole flagstick. LaCava said Nicklaus’ career majors victory record wasn’t at the front of his or Woods’ mind. LaCava said Woods’ scheduling earlier in the year was helpful. He didn’t play the Valspar Championship or Bay Hill Invitational, which he has won a record eight times, but the rest obviously proved beneficial. LaCava had had inquiries from other players to work part-time while Woods completed his extensive rehab. But LaCava highlighted all of the positives of the long layoff caused by the injuries and ineffective surgeries that had left Woods imprisoned by debilitating pain. He couldn’t walk or sit down or lay down or pull himself out of bed. The epidurals and cortisone shots provided him no relief. But LaCava got to see all 10 of his son Joe’s high school football games. He was able to drop his daughter, Lauren, off at college near Boston. A big sports fan, he went to many New York Giants, New York Rangers and University of Connecticut games. LaCava, a single-digit handicap, also played a lot more golf, including at places like Ridgewood Country Club in Danbury and Baltusrol Golf Club in Springfield, N.J., which has hosted several major championships. LaCava joked he was home so much that his wife, Megan, would like him out of the house. Woods will shoot for his 16th major title in the PGA Championship on May 16-19 at Bethpage State Park on Long Island, where he won the 2002 U.S. Open. Then it’s the U.S. Open June 13-16 at Pebble Beach Golf Links in California, where he romped to a record 15-stroke victory in the 2000 national golf championship.